Barely a month in and 2017 has already brought a torrent of change that’s incited some uncertainty and anxiety for the future. But change isn’t always for the worse, so the opportunity to reinvent ourselves is one to be embraced. Improvement comes in a myriad of forms, from purging toxic habits to focusing on positive ones, and we go headlong into the idea with all guns blazing. But after a few weeks, it can feel difficult to stick to the plan. But that’s why we need little reminders when we’re feeling weak-willed. 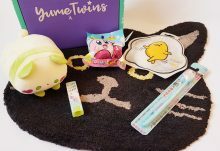 And there’s no better assortment of inspiring trinkets than a curated subscription box like Boxcitement, where each delivery is brimming with a trove of items to lift your spirits. Replete with stationery, jewellery and bath time luxuries, the January 2017 collection does the trick; with its ‘Newbie You’ theme, the contents have been selected to make your go at resolutions a little bit easier. 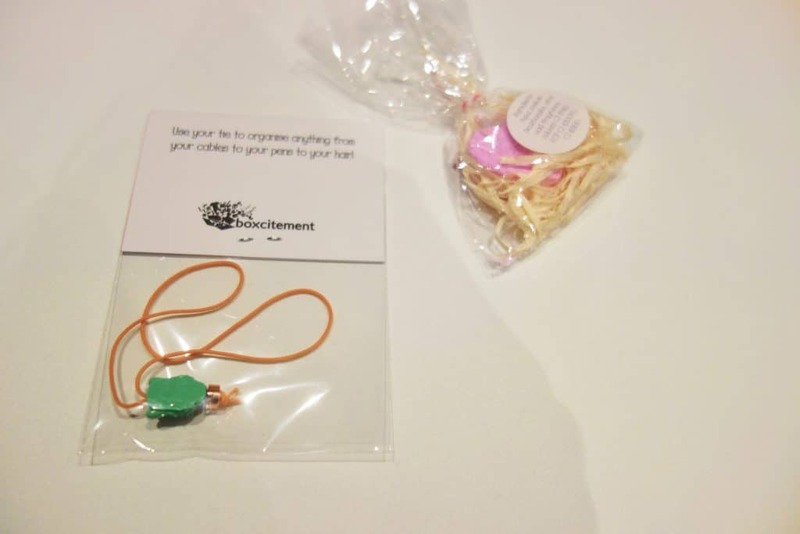 Handcrafted and exclusive items are pulled out one by one, each one a tool to help you focus your thoughts or merely a visual reminder of what you want to achieve. The range of objects is impressive, from a delicate bracelet to an A5 print. 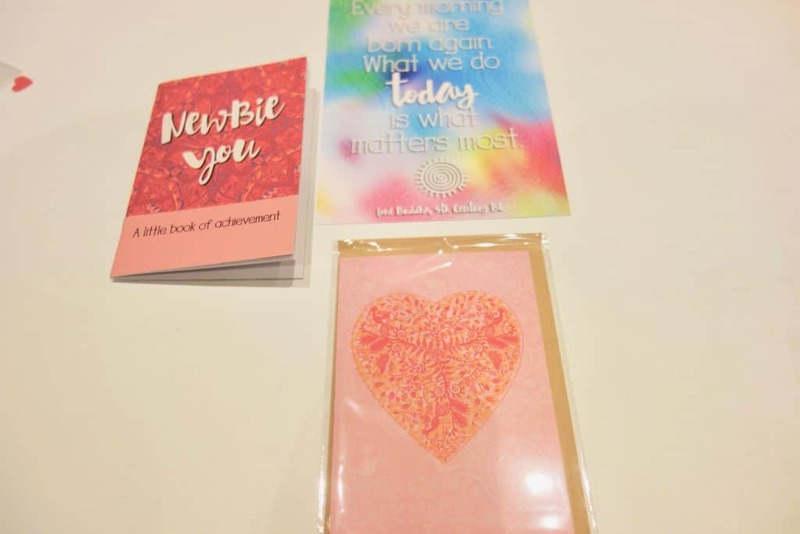 On the stationery side, there are several appealing items: an achievement notebook, a greetings card, an A5 print with an aspirational message and four mini-motivation cards. The notebook is decorated with an abstract pink pattern and the theme – Newbie You – printed on the cover. Inside, there are colouring pages, which taps into the trendy mindfulness movement and is supposed to be a cathartic pastime. 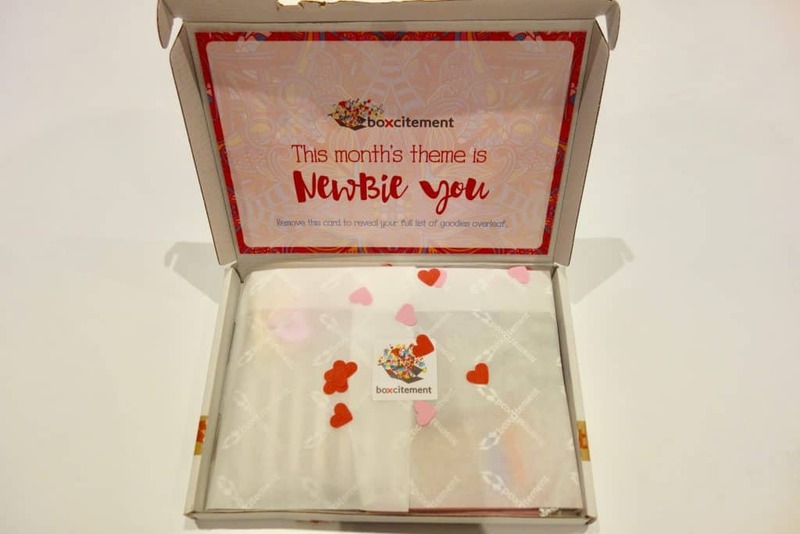 The greeting card is an exclusive design to Boxcitement subscribers, boasting a heart and printed on high quality stock that’s perfect for upcoming Valentine’s Day, or merely to remind someone else that they’re loved. The colourful print reads ‘Every morning we are born again. What we do today matters most’, which is a firm reminder to live in the present and not dwell on the past, handy to prop up on your dresser for a daily pep talk. 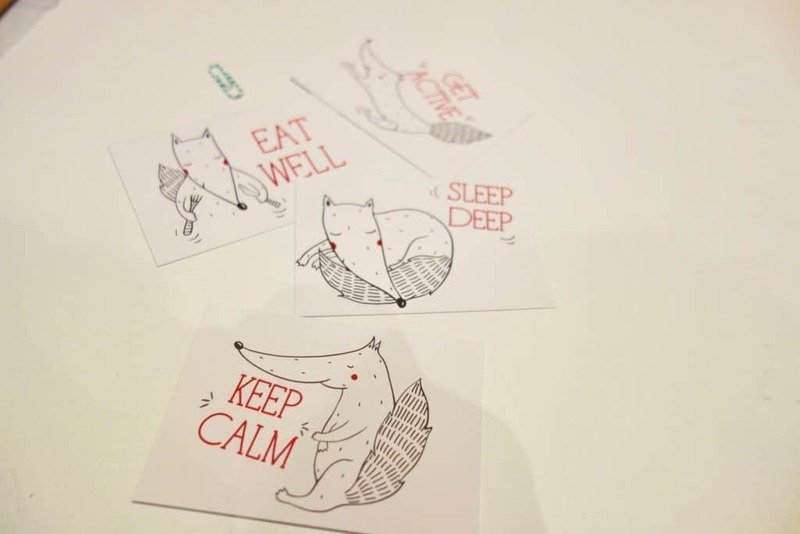 The mini-motivation cards are illustrated with a fox, prompting us to keep calm, get active, eat well and sleep well. These are perfect to tuck into a book or notepad to keep you on track. The handcrafted bracelet is made of round, semi-precious gemstone beads and a small silver heart charm. Mine was a lovely muted green colour, reminding me of jade. It’s a handsome and high quality item that I’d be happy to wear as a constant plea to take a deep breath every now and then. 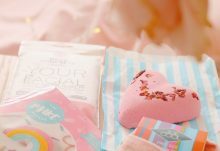 The ‘me-time’ bath bomb comes in the shape of a heart and, while small, looks like an ideal relaxation tool. Finally, the ‘ohm-ni tie’ is the type of simple organisation device that I can get behind. Perfect for cords (think headphones or phone charging cables), which is another box exclusive. This can also work as a hairband in a pinch, so it’s something useful to have thrown into your bag. Goodbye tangled cords! 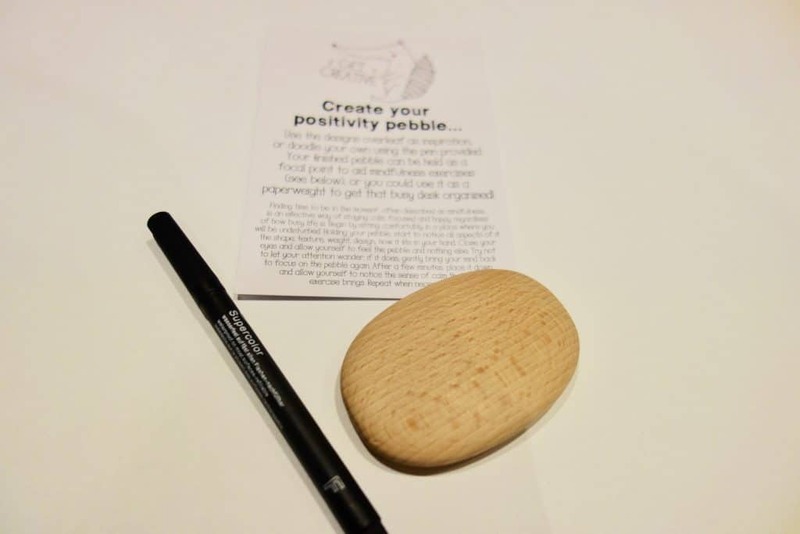 The Positivity Pebble intrigued me the most, arriving as a smooth, wooden stone that fits in the palm of your hand. 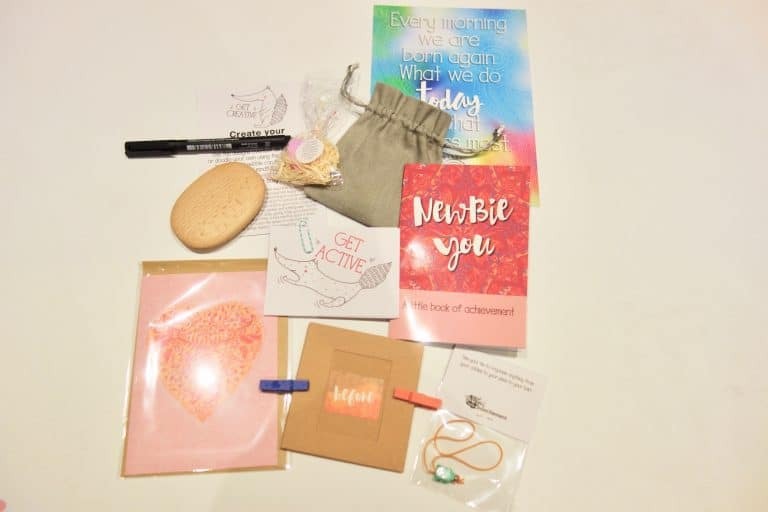 It arrived with a short instruction sheet and a black marker pen, asking you to be creative and brand it with your own motivational messages or doodles. This can be another visual reminder to keep your resolutions in tact, or as a paperweight to ensure it finds its place on your desk or in your home. The final item comprises two small paper frames, two mini pegs and some twine. The frames are labelled ‘before’ and ‘after’, inviting subscribers to document their journey with two photographs. Most of us have made resolutions to exercise, get into shape and eat healthier – this is something that can result in drastic positive visual differences, so it appeals to our Instagram-loving side. I’m training for a marathon, so I’m hoping to see the difference come April! For those who, like me, were in need of some motivational assistance as January lingered on, this collection of useful, eye-catching items will delight. An endearing collection of items that would help anyone stick to their resolutions with ease.